Click a day to book. Children must be attended to at all times. In respect to our salon staff a 24-hour cancellation notice is required for all appointments. A 50% cancellation fee may be charged for any late cancellations. Salon guests arriving 15 minutes late for an appointment may be subject to rescheduling. All chemical services and updo’s will be asked to put a credit card deposit down. If you no show your card will be subject to a charge of 50% of the service. Hair services are only guaranteed with the use of professional products purchased at Shear Art Hair Studio. 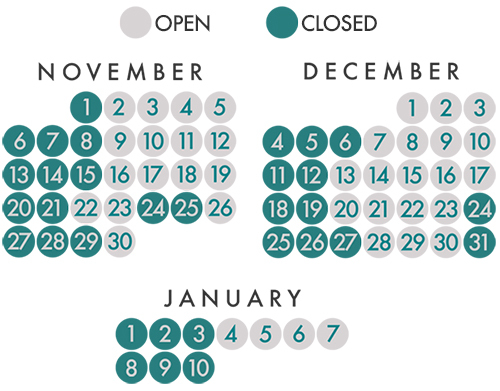 let you know about our holiday hours. We're looking forward to sharing the Holiday Season with you! As of May 3, 2018 Shear Art will be located at 2806 E 42 nd St. Minneapolis MN 55406. We're excited to be a part of our new neighborhood and we can't wait to see you there!